Here are some pictures of my new leg! Hi Everyone, today is Friday and I have just arrived home from the hospital since arriving there on Tuesday morning. Earl has had a bit of a tough week, starting on Tuesday when we found out that his hemoglobin counts were low. They needed to give him 2 units of blood and after the first one he had a reaction. This was quite scary as his head and lips began to swell and he broke out in hives from his waste to the top of his head. The nurse acted very quickly as we watched this reaction appear before our eyes. She administered Benadryl and it wasn't too long before he started to respond. 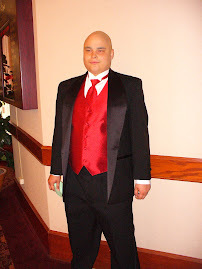 His chemo was put on hold and the next day his counts were still low, so they gave him another unit of blood...this time starting with the Benadryl first. Thankfully, no reaction thins time. The chemo resumed but Earl was very tired and needed to sleep. The other events of the day were that Earl's roommate and several others on the ward were found to have MRSA a superbug found in hospitals. They had to find a private room for Earl, which did happen by the end of the day. Problem #3 Earl's leg was swelling so they sent him for an ultral sound. They have found something but due to the metal in his leg the test was somewhat inconclusive. We are waiting to find out what is causing the swelling. Tonight when I finally left Earl was feeling much more like himself and looking forward to and evening watching hockey and sleeping. Posted by A Journey with Cancer at 8:29 p.m. I am heading back into hospital tonight to resume chemo tomorrow. Thank you to all of you who keep in touch and encourage me. Would you please keep me in your prayers that the chemo will be effective and that I won't get sick. Also, as I begin to use my leg....(I can actually walk with 1 crutch for short distances) please pray that I would work hard at my physio and that my leg would continue to get stronger. 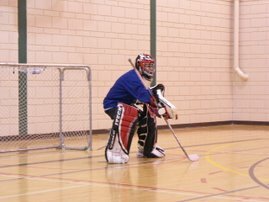 My ultimate goal is to be back in net for the Canadian Winter games in Quebec City at the end of February. 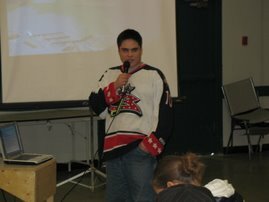 Posted by A Journey with Cancer at 3:52 p.m.
"Enriching the lives of Canadians with an intellectual disability through sport"
For the past 23 years, TSN has been a strong supporter of Special Olympics Canada, helping generate awareness and support fundraising efforts for the organization and its worthwhile and rewarding programs. TSN celebrates the inspirational achievements of Special Olympics athletes across Canada with its seventh annual Special Olympics Day, airing Saturday, November 10. 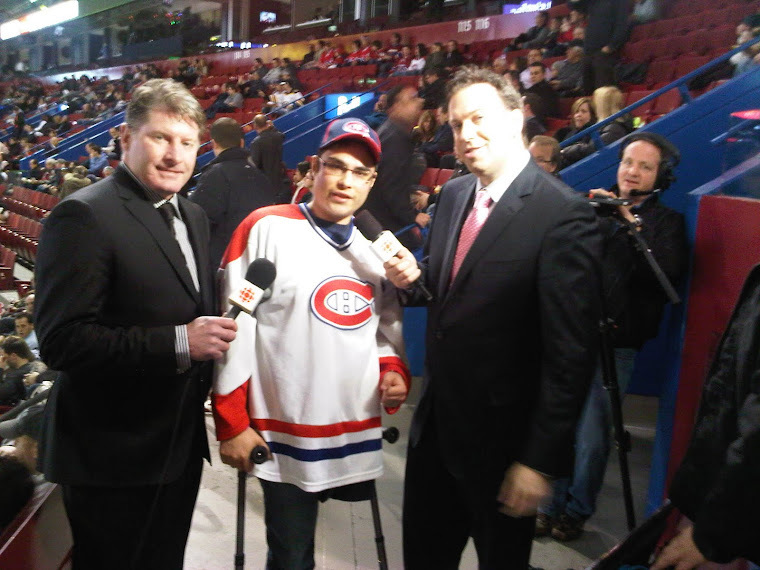 Highlighting the day is the live two-hour special � Special Olympics Day on TSN � at 1 p.m. ET (encore on ESPN Classic at 6 p.m. ET). Hosted by Vic Rauter and Jennifer Hedger, the show honours the accomplishments of Special Olympics athletes, coaches and volunteers across Canada. Features and interviews include a profile on Earl Cook, a member of Manitoba's Floor Hockey team, and Saskatchewan native Michael Qing, who won four silver medals at the 2007 Special Olympics World Summer Games last month. The show will also feature figure skaters Teagan Laxton and David Robertson, as they prepare for the 2008 Special Olympics Canada National Winter Games in Quebec City. Viewers are invited to call TSN's Special Olympics hotline at 1-888-888-0608 from 1 p.m. to 8 p.m. ET to donate funds to Special Olympics Canada. A number of Canadian celebrities will be on-hand to answer the phones, including I.B.F. World Junior Featherweight champion boxer Steve Molitor, actress Tara Spencer-Nairn of Corner Gas and MTV host Daryn Jones. Callers will also receive information on volunteer and coaching opportunities with Special Olympics Canada. TSN has been a strong supporter of Special Olympics Canada for 23 years. The organization, now celebrating its 25th anniversary of the Special Olympics Festival, is dedicated to enriching the lives of Canadians with an intellectual disability through sports. Over the years, hundreds of TSN staff have donated their time and efforts to Special Olympics Day on TSN and the Special Olympics Festival Breakfast & Gala. TSN has televised both the Canadian and World Special Olympics Games and Special Olympics World Summer Games. Special Olympics athletes have also appeared on TSN's highly acclaimed sports talk show Off The Record. You can make a donation or find out more about Special Olympics by logging on to www.specialolympics.ca. Posted by A Journey with Cancer at 5:11 p.m.